ICG Invest Geothermal addresses today’s burning issues in geothermal investment in creating and fostering an investment and financing ecosystem to provide a line of informed public and private equity to fuel growth. 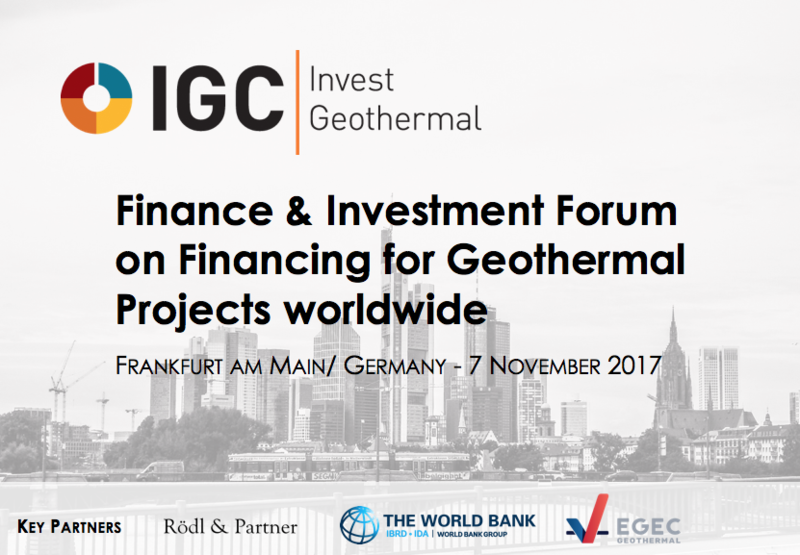 Organised by ThinkGeoEnergy and Enerchange and held in Germany, at the heart of Europe’s financial sector, the event will be focusing on important elements of investing in geothermal energy development, such as risk mitigation, early stage financing, market incentives, blended financing options, multi-player projects and exit strategies. The IGC Invest Geothermal event aims to create an annual forum and platform for geothermal industry geothermal industry (GI) leaders and international investors, including private equity, infrastructure, debt, institutional investors and public equity funds, as well as public funding partners such as development banks, funds and institutions. It further is set up to help increase awareness among investors and the geothermal energy industry to educate about opportunities and challenges of investments in energy infrastructure development globally. EGEC is proud to be partner for the event. For further details visit the event website.